Carol was looking for a Tuscany Passport Invitation for her daughters upcoming wedding so I adapted my Vintage Italy design to include a Tuscan flavour. Carol thought the Vintage Italy theme passport would be perfect for her daughter's wedding in the beautiful Italian region of Tuscany and with a few changes I was able to create the perfect unique design for her special day. I love the Vintage Italy design anyway but when asked to add a Tuscan flavour to it I didn't have any trouble sourcing the perfect image. A photograph of the Tuscan hills with a traditional Italian Villa standing at the top made the perfect addition to the design. I added a photo of the tower of Pisa to the back cover along with Brittany and Jonathans monogram. Carol and her daughter Brittany have left me a lovely message about their Tuscany Passport Invitations. "Amazing! My Mom found Kate online and requested her to make a passport invitation for my upcoming wedding in Italy! She sent us a gorgeous sample to our home in the US and I was blown away! We couldn't believe how beautiful our invitation turned out and the final copy was exquisite! This invitation has truly brought our wedding up a notch and we couldn't be happier! Are you planning a wedding in Italy? Or perhaps you're planning an Italian theme to a party or event? All of my designs can be customised to suit you so if your wedding is in Lake Garda or you're holding an event at the Italian Embassy in Washington DC contact me with your requirements and I'm sure I can create the perfect design for you. 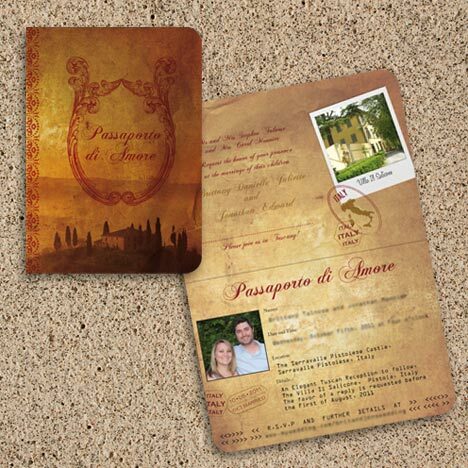 Contact me if you'd like to see more examples of Tuscany Passport Invitations or click here to see more examples of Italian Wedding Stationery.